This year, Pinehurst No. 2 will be the first golf course to host both the men's and women's US Open Championships, over back-to-back weeks in June. The Donald Ross design has previously hosted three major championships, the 1936 PGA and the 1999 and 2005 US Open, as well as hosting the 1951 Ryder Cup and 2008 US Amateur. However, for this year's events the famous No. 2 course has been redesigned and altered to offer a different type of challenge. 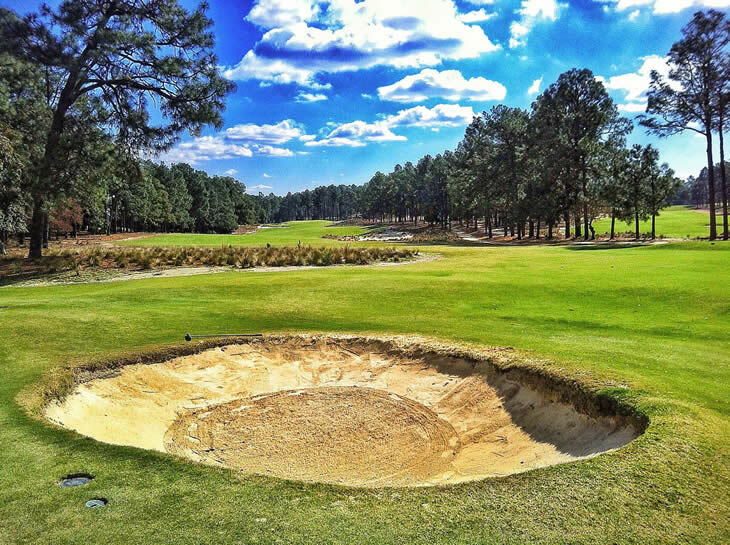 I was lucky enough to visit the Pinehurst recently and got a chance to stay on-site, play some golf and put my game to test over the No. 2 design. 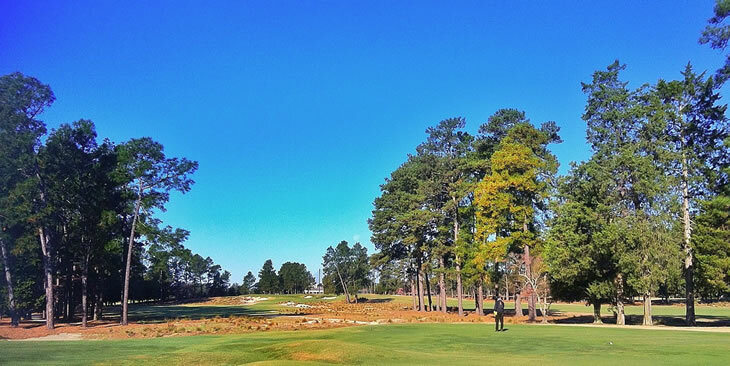 It's hard to get a real appreciation for Pinehurst until you set foot on the resort. The best way I can think to describe it is to call it golf's Mecca. Avid golfers flock from across the globe to stay and play at the resort. Whilst Pinehurst No. 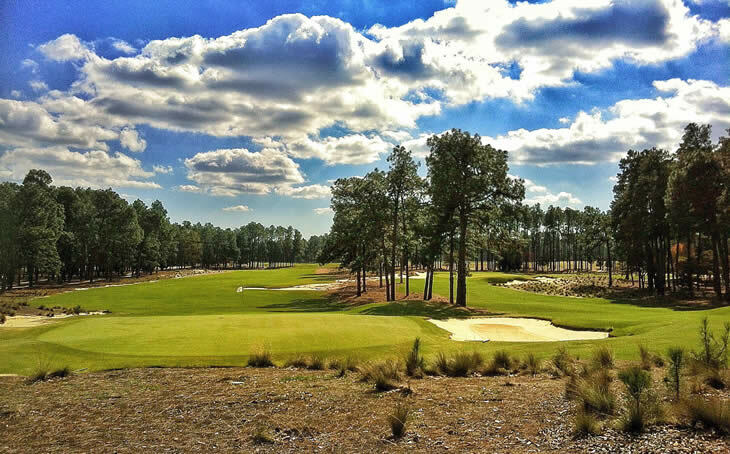 2 gets all the attention, there are seven other courses within Pinehurst that all offer a different style and challenge to visiting golfers. Having sampled No. 4 and No. 8, we saved the best for last, getting an early tee time on No. 2. Like all golfers that play Pinehurst No. 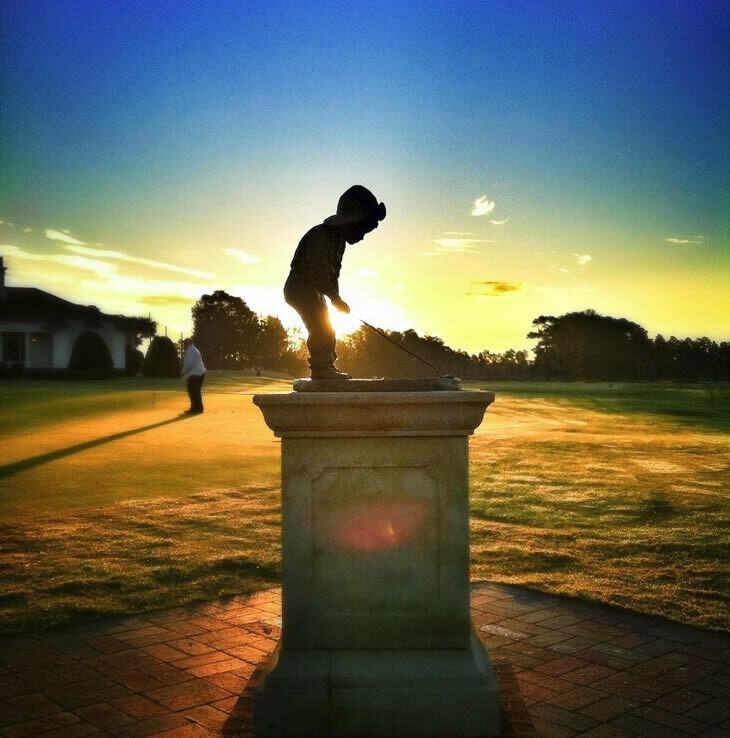 2 we were greeted at the practice green by the famous Putter Boy statue that features prominently across Pinehurst as the resort's official logo. The morning we played was the morning all golfers wish for when planning a trip like this: warm, still, clear and dry. Having settled up for roughly $250 a person in the stylish clubhouse and pro shop, we were met on the practice tee by our caddies. Dressed in white jump-suits, my caddy quickly became my swing coach, putt reader, bag carrier, waiter, tour guide and friend. If you ever get the chance to play No. 2 don't be foolish enough to carry your own set. But back to the course. The main change Pinehurst No. 2 has undergone in recent times is an extensive renovation headed by Ben Crenshaw and Bill Coore. They have overseen several tweaks and changes to the layout, all focused on returning No.2 to its natural look and challenge. Length has been added, thick rough has been completely removed, plants have been added and fairways have been hardened and actually increased in size. Some fairways are now as much as 50% wider than before such as the widened 10th fairway below, which was our first hole of the day. You may think be thinking "US Open with no rough? Surely that will be easy for the players?". Rest assured the set-up for both the men's and women's US Opens will be anything but easy. This is very much a second-shot golf course with the key challenge being the undulations and shaping of the greens. 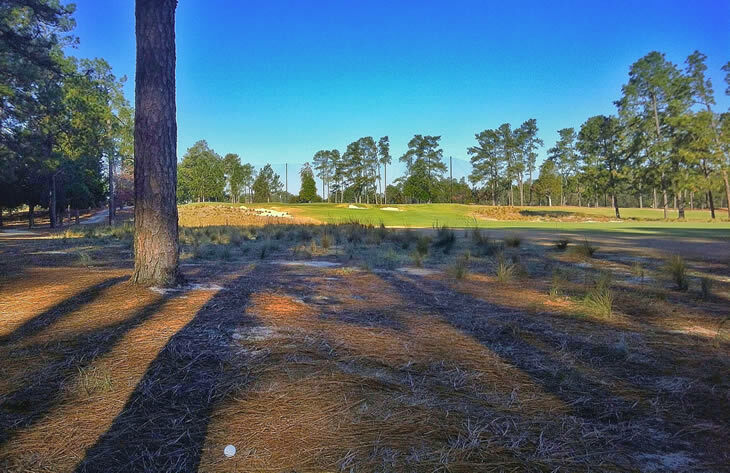 With the lack of rough and firmer, faster fairway designs players will find themselves further off the fairway, often around the trees. These shots would be hard on any course, but with the No. 2 greens, this will be nearly impossible to get close. I found this out the hard way on the 12th hole after finding my tee shot run into this position. Expect to see players chipping out and possibly even missing the putting surface on purpose to leave an easier angle around the green. When carving the course back in 1907, Donald Ross believed in using slopes, nature and testing green complexes to make a course challenging. 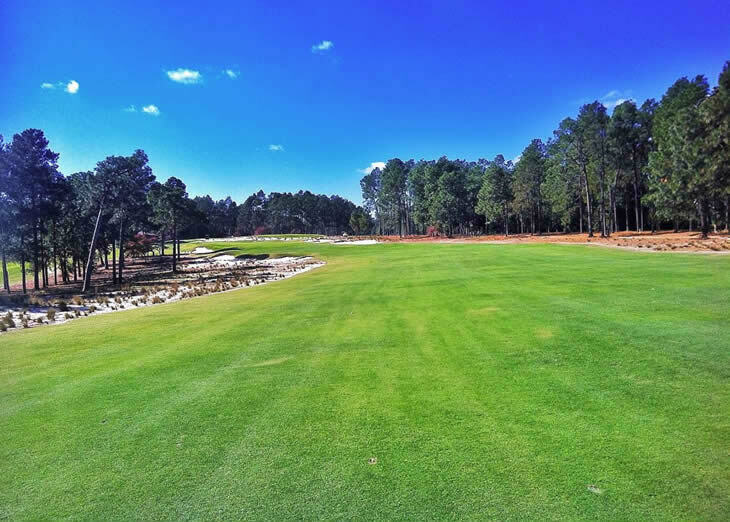 Whilst approximately 300 yards has been added to the course since the 2005 US Open, the main differences you will see and hear about relate to the removal of the rough and integration of natural, sandy areas. 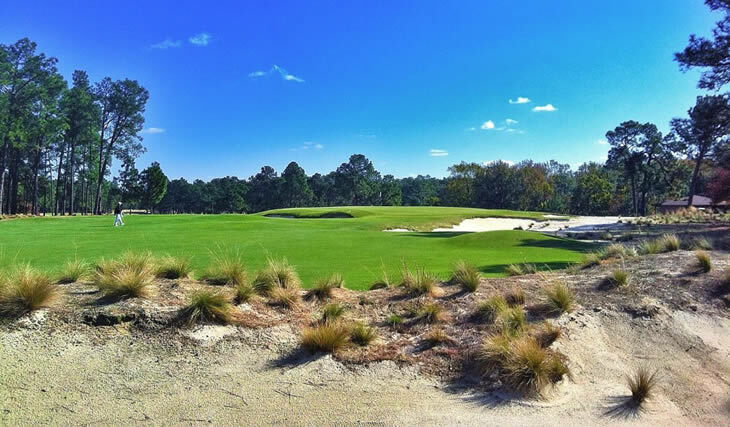 Around 40% of the irrigated turf was removed to make way for these areas of sand, wire grass, pine straw or native grasses. On my day at No. 2, I was lucky enough to be 12th green when I looked over to the next tee and saw Ben Crenshaw. He was standing on the tee staring down the short par-4 13th, with a number of yellow flags in his hand. My caddy told me he had been out a few times recently and that he was trying to get an idea of where he wanted the natural areas to extend to on the fairway and get a visual look from the tee. He placed a number of small flags on the fairway noting the small changes he wanted to make. I didn't get a chance to meet him, but did capture this photo of him visualizing his changes. 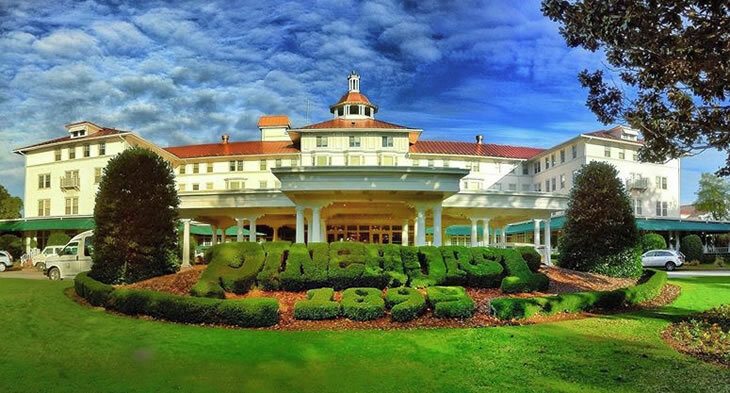 Ask anyone about their visit to Pinehurst No. 2 and you will likely hear horror stories of chips and putts rolling off the green into tricky little collection areas. Whilst the entire course has been renovated, only the 15th and 17th green have actually been modified, allowing for additional hole locations. Many describe the challenge of hitting Donald Ross' greens as trying to get a ball to stop on top of a Volkswagen Beetle, and that is what makes No. 2 so tough. No matter where you are off the tee, or how close you are to the green, you will have a challenging approach, requiring the highest levels of concentration, confidence and creativity. Most of the Pinehurst greens are elevated, many with false fronts. Whilst they look large from a distance, the effective area of where you need to land your ball, or at least have it finish, can be very small. I found this out the hard way on several occasions after hitting what I considered to be good approaches. Those were the words of my caddie. He clearly knew the greens better than me, and those words were his way of telling me to watch what was about to happen to my ball. Time after time, what I thought was a good approach would trickle, roll or sweep away from the flag, further from the hole or off the green. I estimate that during my round at No. 2, I hit 15 greens in regulation... and probably stayed on about 8. Another oddity in the design is that while the course is surrounded and integrated with sand, there are only officially 22 bunkers on the entire No. 2 course. That is to say a bunker is a sand surrounded by grass. Here is a look at one of the 22 bunkers my caddy showed me on the 7th hole, to indicate what is classed as a bunker. Whilst much of the discussion in the run-up to the US Opens will concentrate on the Donald Ross greens, don't underestimate how long the new layout will play, especially for the men. 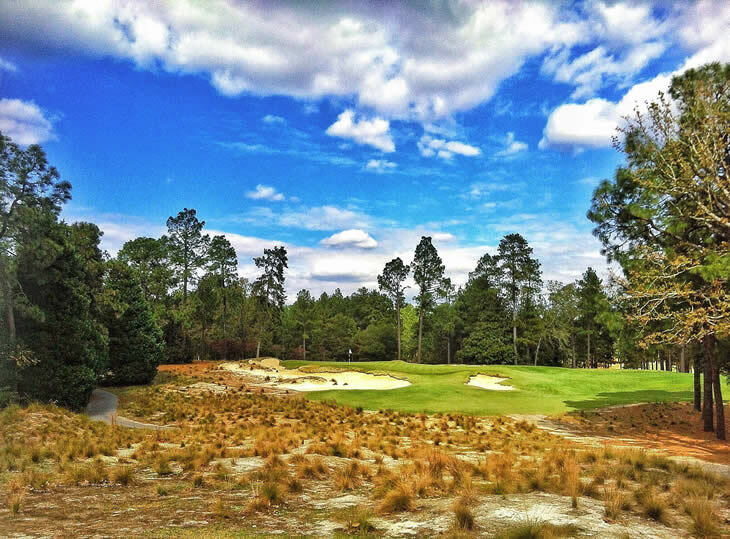 In 1999 the No.2 course played 7,175 yards. In 2005, it was a touch longer at 7,214 yards. When the men tee it up this June, the course will measure 7,565 yards. Whilst those differences may not seem huge, they will make a noticeable difference. The 534-yard 16th hole (pictured below) has been lengthened with the addition of a new tee and will play as a long par-4 and is more than 40 yards longer than in 2005. To give you an idea of how long it can play, I hit a good drive off the forward tee in calm conditions and still had a fairway wood to the green! Much of the analysis of No.2 will focus on these holes as part of a tough final trio of holes and rightfully so. They offer an incredible combination of challenging length, tough greens, shot shaping and spectator galleries. Any golf historian will recall Payne Stewart's par, birdie, par finish that saw him pip Phil Mickelson and Tiger Woods to the 1999 US Open Championship. Here is a photo from behind the 16th green with the famous par-3 17th hole in the background on the right side. Stewart's incredible win in 1999 is talked about everyday in and around the courses of Pinehurst. The admiration and connection Stewart had with the local crowd is as evident now as it was 15 years ago. I even reinacted his famous fist-pump on the 18th green, although my putt was for par not birdie and was also from about 5 feet, not 15. 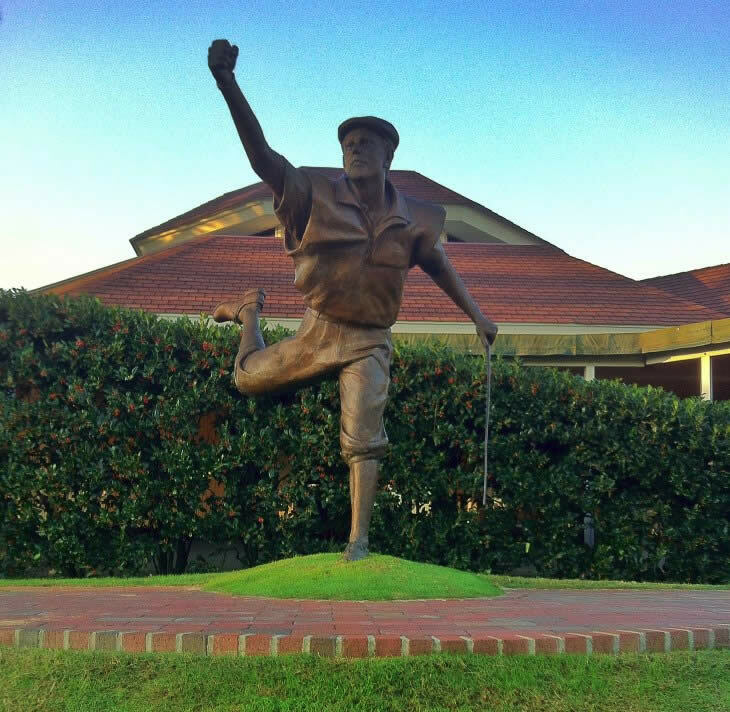 Stewart's victory is permanently remembered at Pinehurst in the form of this statue behind the 18th green. 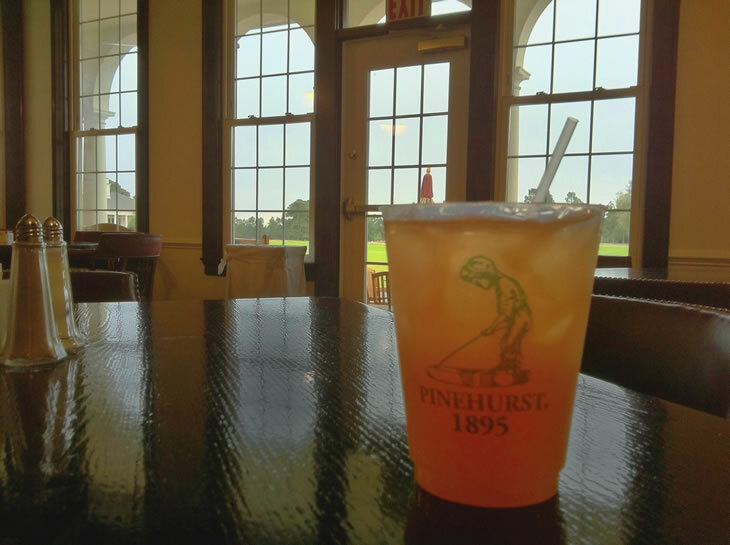 Looking back on my day at Pinehurst No. 2, the thing that still shocks me is the lack of rough. I don't mean there wasn't a lot, or it wasn't thick, there is none. Crenshaw and Coore have done away with the typical US Open-style rough, in favour of a far more natural, running layout. On the surface, each hole seemed relatively straight-forward, but it didn't take long to notice the subtle intricacies and challenges of the bunkers, slopes and greens. One benefit for the casual golf fan at this year's US Open will be the chance to see the best players creativity. With no rough, especially around the greens, players short games will be tested but from relatively good lies. Good short games will be rewarded, not punished by thick rough surrounding greens and fairways. I expect we will see a vast array of chips, pitches, flops and putts from around the green, much like we are used to watching at the Open Championship on this side of the pond. Pinehurst is so different than any other U.S. Open because it so much more relies on the short game than pure ball striking. It’s a wonderful course. I play courses on Tour and we all see it — miss the green, automatic lob wedge, hack it out of the rough. That to me is not fun golf. 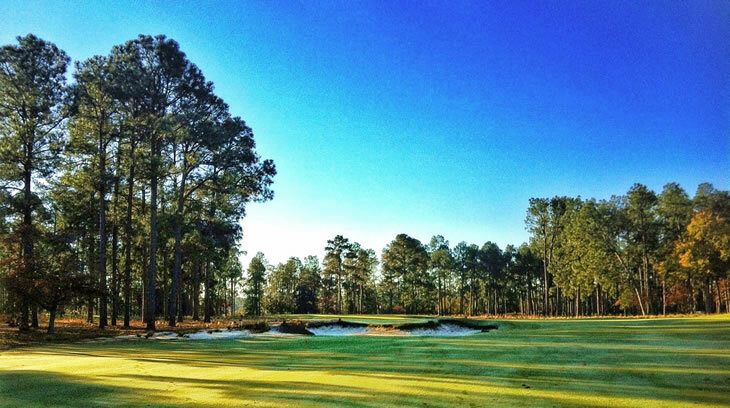 Fun golf is Pinehurst. For anyone lucky enough to visit No. 2 be sure to listen to your caddy's recommendation to retire to the 91st Hole bar. There you can add up your scores, recount your shots and enjoy a signature John Daly cocktail (Sweet Tea flavoured vodka, lemonade and sweet tea). Not sure there is a better way to relax and bask in the enjoyment and challenge that No. 2 provides. 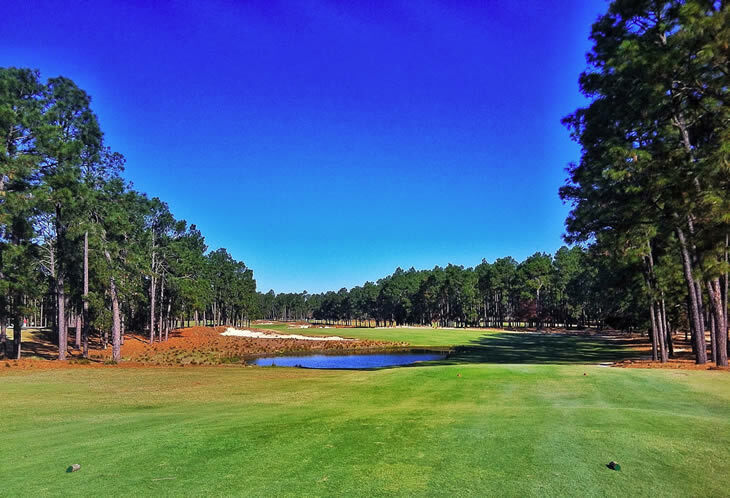 Much like St Andrews offers golfers an out-of-body experience on the way around, Pinehurst No. 2 has that same haunting familiarity and presence. The size of the resort, the nature look of the surroundings, the friendly nature of the staff and caddies, the Donald Ross greens, the Crenshaw/Coore restoration work, the Payne Stewart Statue, everything about the place is memorable. It is safe to say it is a test like no other: hard, fast, undulating and challenge. It's always easy to say that the winner round a course will the player who has his/her game under control, but that is exactly what you need around Pinehurst No. 2. Ross along with Crenshaw and Coore have sculpted a masterpiece that pays tribute to classic course design with enough difficulty and strength to test even the best modern golfers. Safe to say I, like many, will be paying close attention to how the world's best, male and female, golfers play the course in June.